Not too long ago I was able to get my hands on an XP hard transport case. Sure… I’ve seen video reviews, social media posts of people’s thoughts about the case, and other online reviews. Prior to receiving mine I had only seen one in person, one other time, and for all of about 5 minutes. Obviously, that is not enough time to form an opinion of a product. Although some online reviews may have slightly mixed or varying in opinions of the hard transport case, I like to form my own opinions. Some people seem to love the hard transport case… Some people seem to have their own ideas of a better method of protection. Either way, it’s still protection which translates into peace of mind for the end-user. Let’s face it… When we purchase a machine we like to be able to take care of and protect our investment. Proper care, maintenance, and storage is a big part of that. Whether it’s long-term storage, short-term storage, travel, or just wanting to keep everything in one spot… A good quality Case can be a nice accessory to have to provide that protection and peace of mind. We’ve all heard horror stories of mishaps with machines while traveling. In the past, traveling with other machines, I have used a pelican storm 3100 series to protect my equipment both from damage and from the elements, so I was certainly looking forward to seeing how the XP hard transport case was constructed and how it could suit my needs. 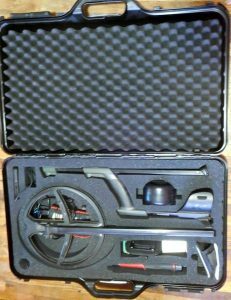 Inside foam is cut precisely to fit your XP detector and accessories. The foam is shaped to hold up to 3 search coils. Upon receiving the case, which arrived quite quickly and undamaged in shipment, I noticed that it was quite ruggedly built. 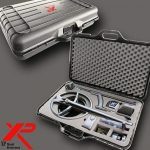 Although it may not be quite as rigid as a pelican case, it still provides quite sufficient protection for the machine and accessories that you will be storing inside of it. XP took all of the guesswork out of things and made the process of storing your machine and accessories quite simple. No more cutting foam to fit what you are trying to store. Everything is already pre-cut, with plenty of storage room as well, and a fair amount of foam surrounding everything to provide adequate protection. Whether you’re throwing it in your vehicle, traveling, or just storing it all in one spot, under your bed or in the corner the case is a great way to get things done. I even found after putting all of my accessories into the case, including charging cable and clip, camera mount, rain dust cover, additional charging clip and cable, headphones, remote, and other parts of the machine I still had room for a camera as well as a portable USB pack that I use for charging the equipment and accessories. I’ve been using the XP hard transport case for a while now and find that it fits my needs wonderfully when it comes to the XP Deus. 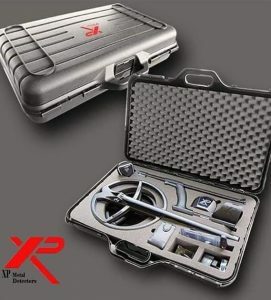 It is also worth noting that the XP hard transport case is not just for the XP Deus. It also works for the other XP models that have the s shaft telescopic stem such as the new ORX. Dust protection, protection from the elements, or just storage, the XP hard transport case will get the job done quite well. Is it the right choice for you? You will have to be the judge of that. For myself and others who have been using the hard transport case for a while now they seem to be very satisfied. 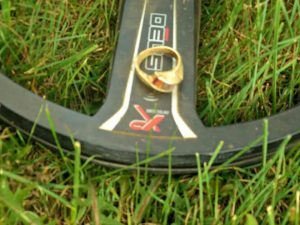 Remember… We’ve all heard those stories about equipment getting broken during transport and travel. You can’t put a price on peace of mind and protecting the gear that we use. Do you play the numbers game? No, I’m not talking about the lottery numbers. I’m talking about Target numbers. No… Not the target numbers you see on your screen but the concentration of Target numbers. The target Rich environment! Some days it’s a fun and rewarding game and other days it can be quite frustrating. It’s a simple formula… To find the targets and that you seek, you have to go to where they hide. Think about it… Where do we find treasure? Obviously the answer is under our coil. Luck may play a part for some people but we still have to get our coil over the Target. Chances are good that we are not going to find civil war relics on your local wood chip tot lot. Likewise, chances are also good you may not find old coins and tokens at your newly built community splash pad. I’m not saying and you won’t find targets in these areas, but you may not find the targets that you are looking for or hoping for. Research can play a big part in finding the areas you seek, as well as talking to the locals, and most importantly listening to what they have to say. Lately I have had a pretty good run on rings. Some good, some bling, some returned and others look nice in the display. 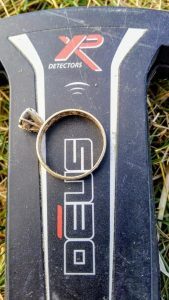 On one particular outing not too long ago I managed to find three rings in about 15 minutes. Some people have asked me how I got so lucky. Short answer… I was playing the numbers game. I got into a target-rich environment where there had been a large concentration of people over a duration of many years. By doing this I increased my odds of the potential of finding jewelry. Believe me you’re going to dig your fair share of trash but as long as you are patient and move slow you will find the good targets that you seek. 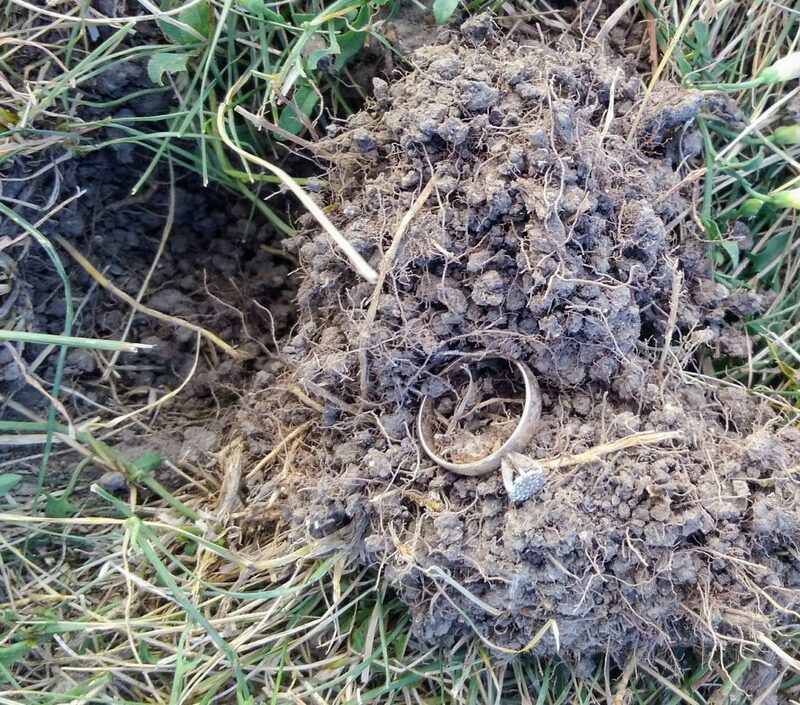 Over a short duration of time, working just a couple small areas of this location I have pulled I believe 9 rings including a diamond ring and a couple of silver earrings. You’ve got to be patient, persistent, determined and willing to play the numbers game! The flexibility and versatility of the XP Deus can be an asset in these areas where targets are concentrated. Get out there and play the numbers game! Well I am here to inform you that’s not true in fact the guys at XP Metal Detectors placed performance at the top of their list when designing the ORX. The factory pre set programs are a very good starting point if you just want to enjoy the ORX for what it is, but as time progresses it’s always nice to open the throttle and see what she can do. 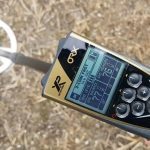 During our testing we found the ORX to be very well behaved but you could easily unleash the devil by switching from Coin Fast to Coin Deep providing your site conditions allowed it. Coin Fast has impeccable manners but it can be pushed if needed by simply lowering the discrimination to 5.5 or lower, then raising the sensitivity up a few notches, we found 99 was still usable, although a little EMI was noticeable. What if I change the parameters using Coin Deep ? Good luck with that one, Coin Deep uses a different filtering and punches hard ! 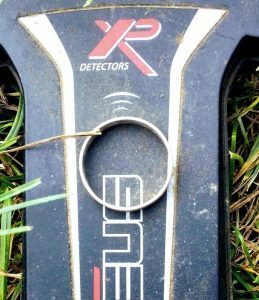 If your metal detecting site conditions will allow “Full Throttle” using Coin Deep….Hang on to your hat because the ORX is an animal. 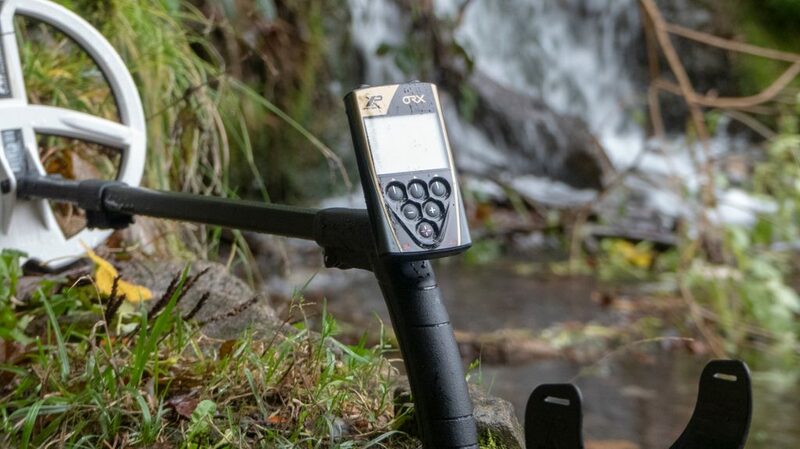 Check out Gary’s latest XP Skill School video showing how to push the ORX to the limits along with some other great tips. 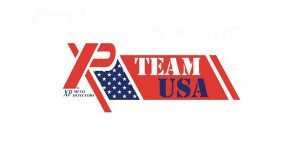 There’s more XP talk over at the XP Team USA Facebook page, drop by and say Hi, we would really like to hear from you. After upgrading my arsenal to the Xp Deus I have found that the quality of my finds has improved greatly. The second time out with this beast of a machine I found a silver quarter, A few hunts later was a 1943 walking liberty half dollar. I realize now that my biggest regret was that I had not purchased this machine earlier. I think I had set the standard pretty high on the last hunt I had. 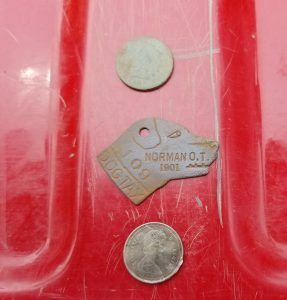 I had two days in a spot in Norman Oklahoma that really produced some great finds. 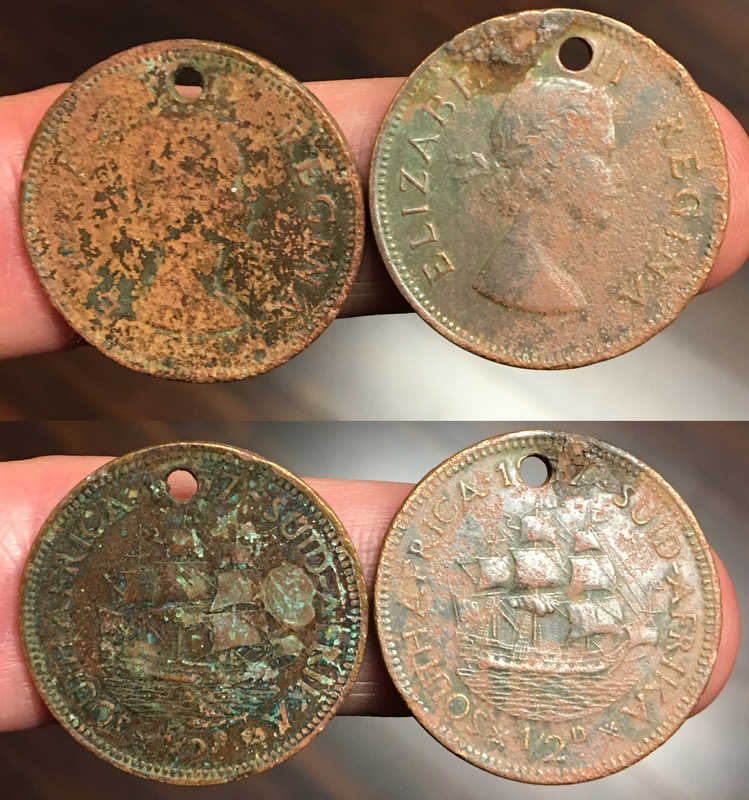 My first good find on day one I pulled out a 1915 Wheat penny, followed by another wheatie in the same hole. 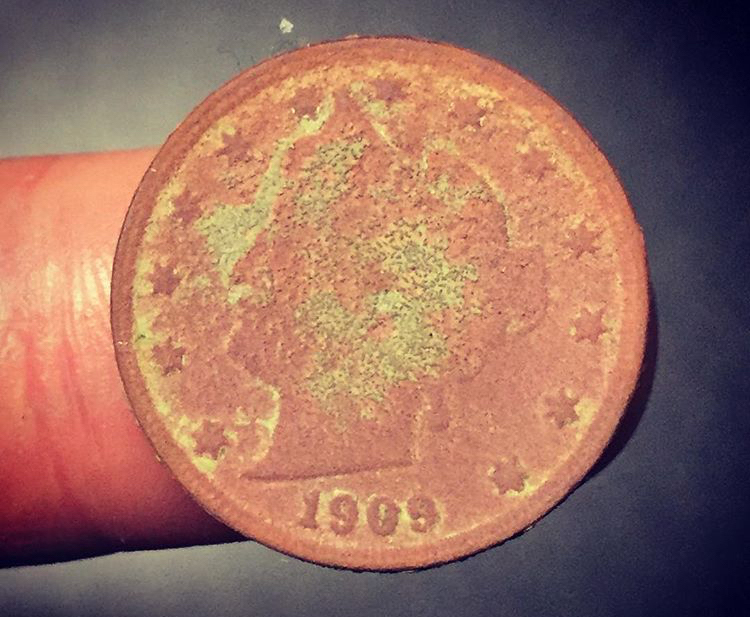 I realized there was another signal in the hole, I located it and found that it was a 1905 Indian head penny. I then found another wheatie in the hole. All together there were three Wheaties and one IHP all in the same hole. I got about 10 foot down from that spot and hit another good signal with my Deus. It rang up as a 92 on one side and as I turned 90 degrees it then rang as an 88. 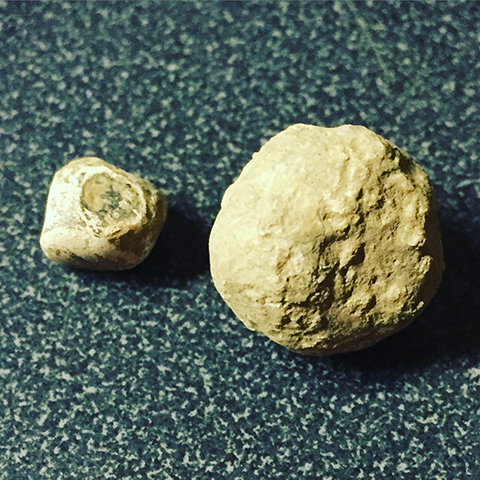 I dug it up and immediately I saw a shiny silver small round something. I pulled the round shinny object out and saw that it was wiped smooth and very thin. I could make out one dime on the back. I figured it was a seated dime as thin as it was. It had to have been in circulation for a very long time. 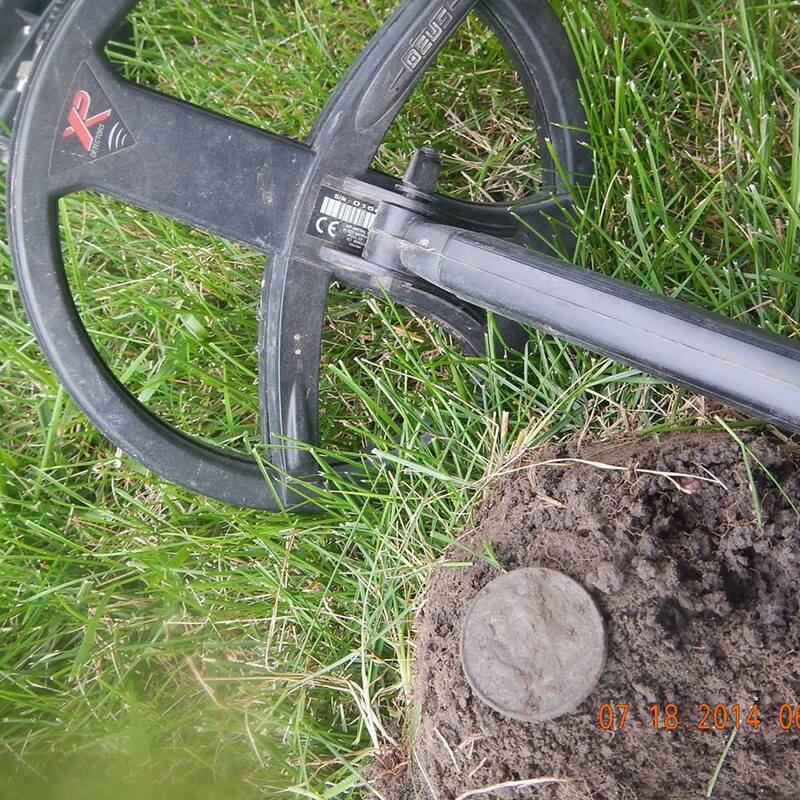 I then realized there was another signal in the hole and found a 1920s wheat penny in the same hole. 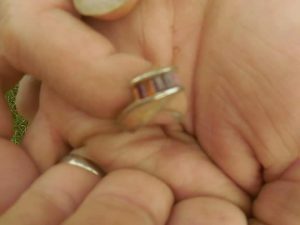 I then found an old copper ring in the same hole. I was having a great hunt. The next day I went out and hit a spot just down from that and my first hole was an IHP, after that I got a 71 signal. 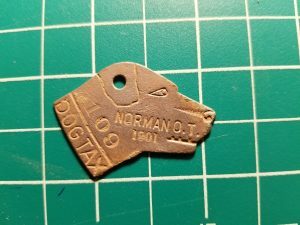 I dug it and it was a dog tag. I could not make out any writing on the tag but it was in the shape of a dog head and had a hole on top. My buddy and I were comparing our finds afterwards and I showed it to him. I decided to spray and scrub the tag to see if it had any writing on it, after he made the joking comment, “if it doesn’t have any writing you might as well toss it.” I scrubbed both sides when I started seeing writing. The writing said 1901 Norman O.T. Dog Tax. I was pretty excited to see that it was pre-statehood and Oklahoma Territory. 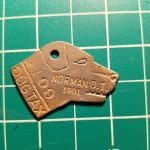 After doing some research I had found that this is now the oldest known dog tag discovered in Norman Oklahoma. What a very cool find. Norman Oklahoma has a very old history. Have you ever had one of those hunts where you make that nice find right out of the gate? After making the nice find, you think “Wow” it’s going to be a great day! Sometimes it ends up turning into a stellar hunt, while other times you find out at the end of the day that you could have packed up and went home after the first find of the day. I’m sure many of you have had this happen in the past as well. Even though it’s a pleasant surprise when you find that nice coin or relic right off the bat, it’s that thought of not knowing what the next target could be, or knowing when that next good item will pop up that keeps us out there hunting all day! Another good example of this scenario happened to me again, a while back. 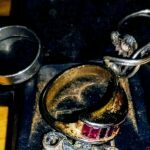 Not too long ago, I was approached by a person that had just recently gotten into the hobby. It seems that a few others had recommended to him to reach out to me. Although he had done some hunting on his own in the past, he sounded excited about the prospect of hunting with another person. 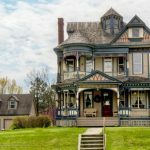 We met up at my house and as I loaded my gear into his truck we had a brief conversation about things that people have found or would like to find. 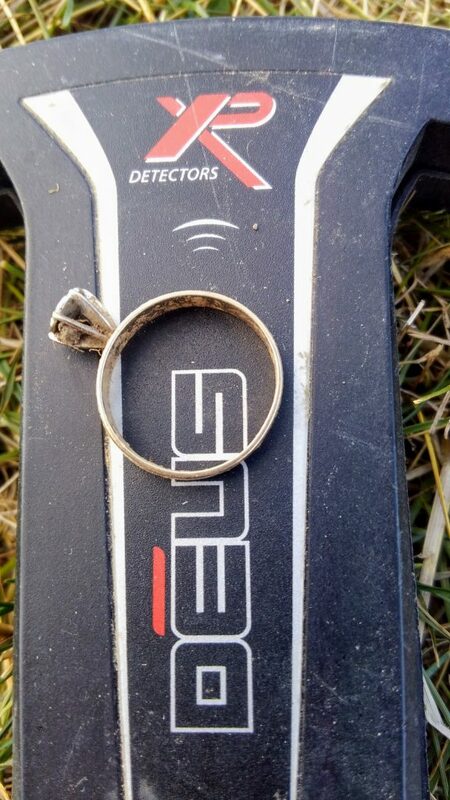 I had mentioned to him that we all love seeing stories of people making fabulous finds, or even being that person that is just lucky enough to dig up a gold or diamond ring. 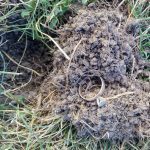 I had mentioned that some of us would love to be able to go out and find a gold ring every day but that in all reality there are far more other undesirable targets that ring up in that same range that many times there may be no gold at the end of the day. After some quick discussion of where to hunt we headed off, as it was already late afternoon and we were losing daylight. We settled on a nearby spot that has been productive for me in the past. I told him that the location has yielded old coins, relics, and even jewelry. There was also the potential for plenty of clad coins but the area was massively littered with pull tabs. A lot of people don’t like to hunt this area because of all of the pull tabs and trash but if you are patient and persistent you can usually find something worthwhile. You should have seen the expression on his face when I pulled my Deus out of the truck! Many times I use the remote on an arm band for my Deus, so naturally he asked me if I had everything because he saw no screen and had never heard of a Deus. I quickly explained what the Deus was and gave a quick rundown of features. We fired up the machines and started hunting and within seconds I had my first signal. Recovering the target I announced to him that I had recovered my first pull tab already. No sooner than I stood up and started to swing my coil the Deus grabbed a second target, not even a foot away! With a slightly different sound and VDI I had to dig. My hunting friend for the afternoon heard me laugh and say “Well that’s a nice surprise”. 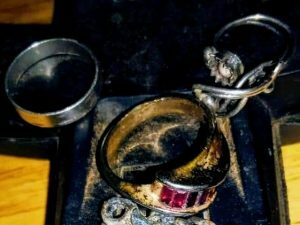 Wanting to know what I had found I referenced our conversation from earlier about finding rings. Not having gotten a good look at it yet, my initial thought was that it was gold plated. I took a few steps over and showed it to him and he confirmed that the inside of the band was stamped 10K. I kind of laughed and sheepishly stated “It doesn’t happen every day like this, honest”. He congratulated me on my find and we ended up hunting well into dark. Although nothing other than clad coins was recovered after that, we continued to search for another good target before we called it a night. 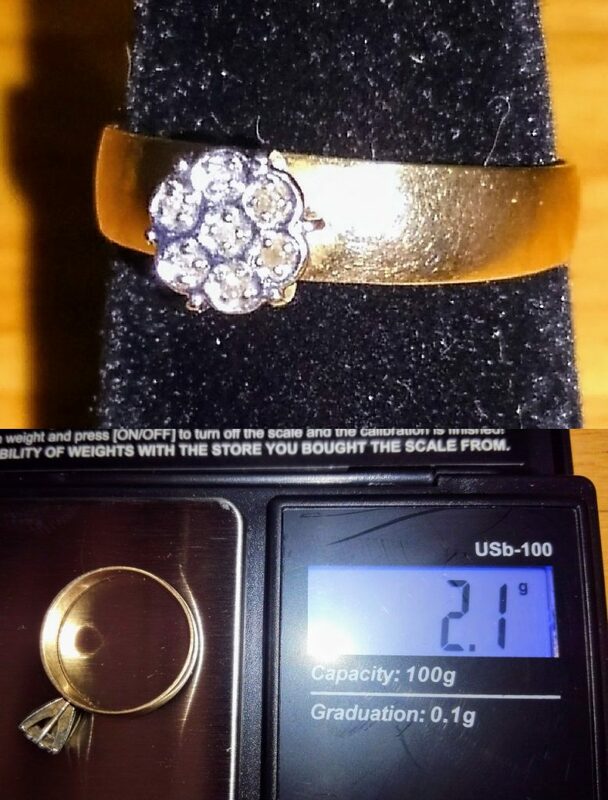 I brought the ring home and cleaned it up, acid test, diamond test, and trip to jeweller for final confirmation revealed it was a 10K yellow gold ring with vintage diamond cluster setting. 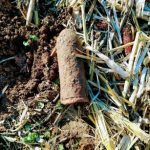 Moral of the story, whether that great find comes in the first 60 seconds or last 60 seconds of the hunt, the thing that drives us is not knowing when that next one will turn up. With the speed and performance of the Deus I have returned to this location a few times and recovered more jewelry items. I don’t know about you but I’m just fine working those pull tab infested areas! Get out there and find your history! The Junk Man Ohio Civil War Medal, Deus Dreaming. Deus Dreaming Army of Angels 13K The Junk Man Tim Glick. 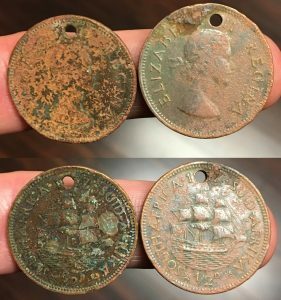 Tim Glick AKA “The Junk Man” had found a great find about 4 years ago on a residence that used to house an old school from the 1800s. 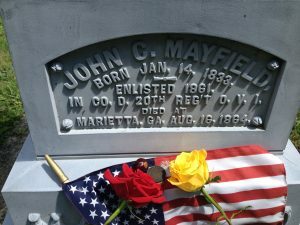 The thing that made this find so special was that it had a name John C. Mayfield of Ohio. 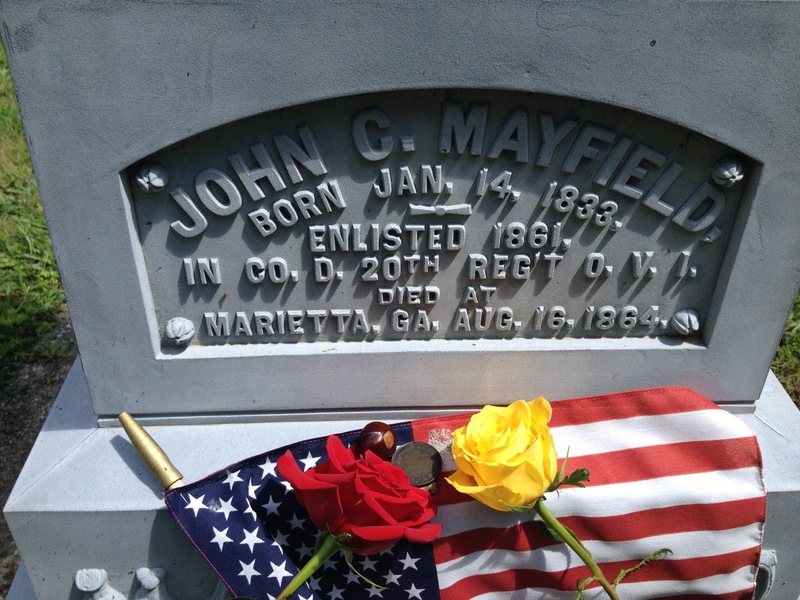 After doing the research, Tim had found that Mr. Mayfield died in action in Marrietta Ga. on Aug 16, 1864. 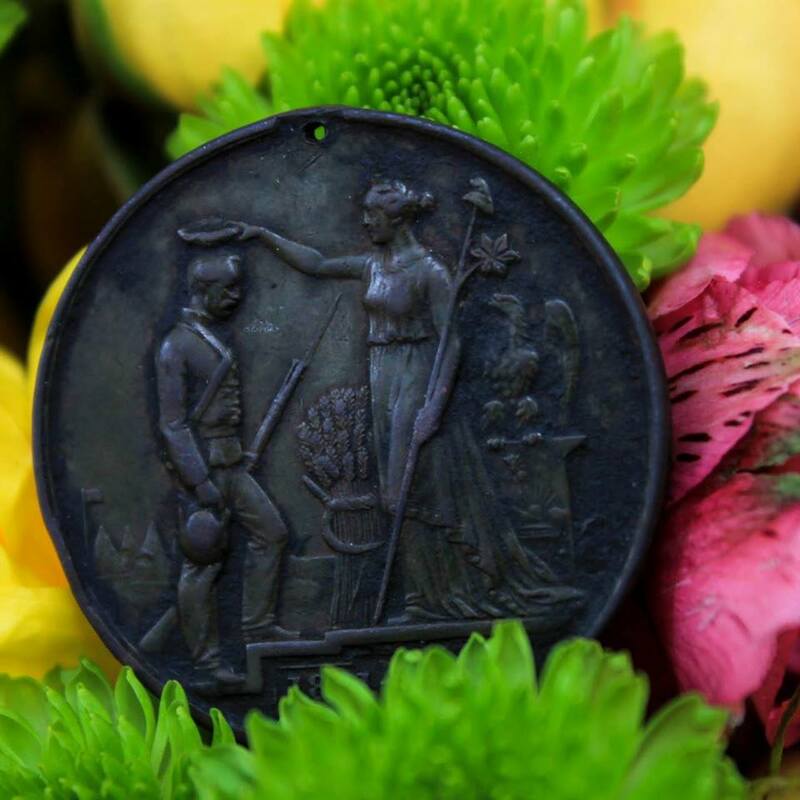 Tim had found that these medals were made by Tiffany & Company of New York and 20,000 were made and distributed in 1866. 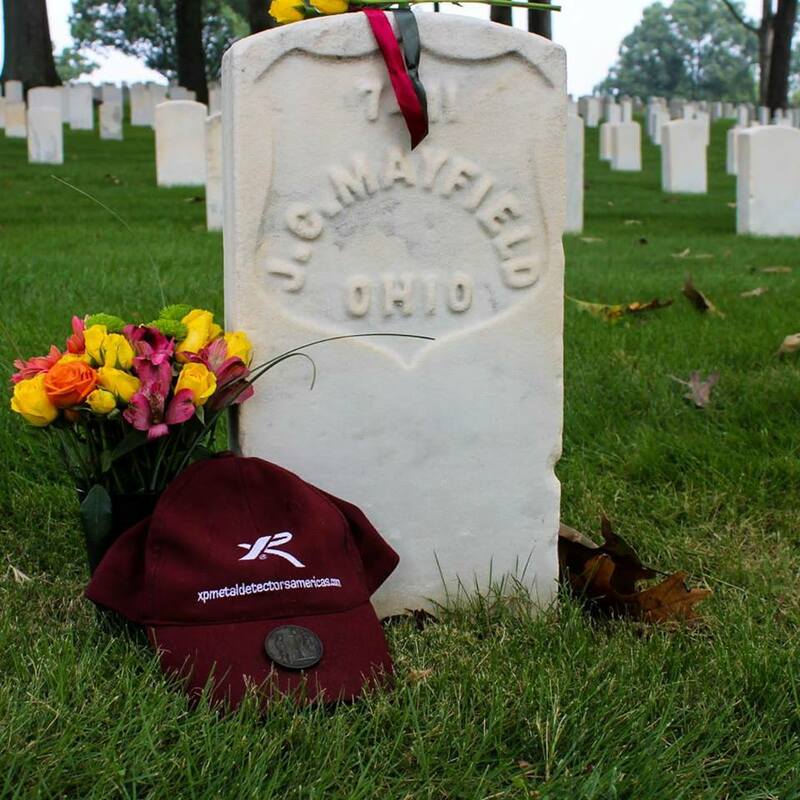 Mr. Mayfield had passed before receiving his medal and so the metal was distributed to Mr. Mayfield’s family. 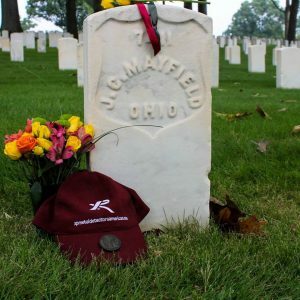 Tim Glick had tracked the grave of Mr. Mayfield and his father who also served in the civil war. 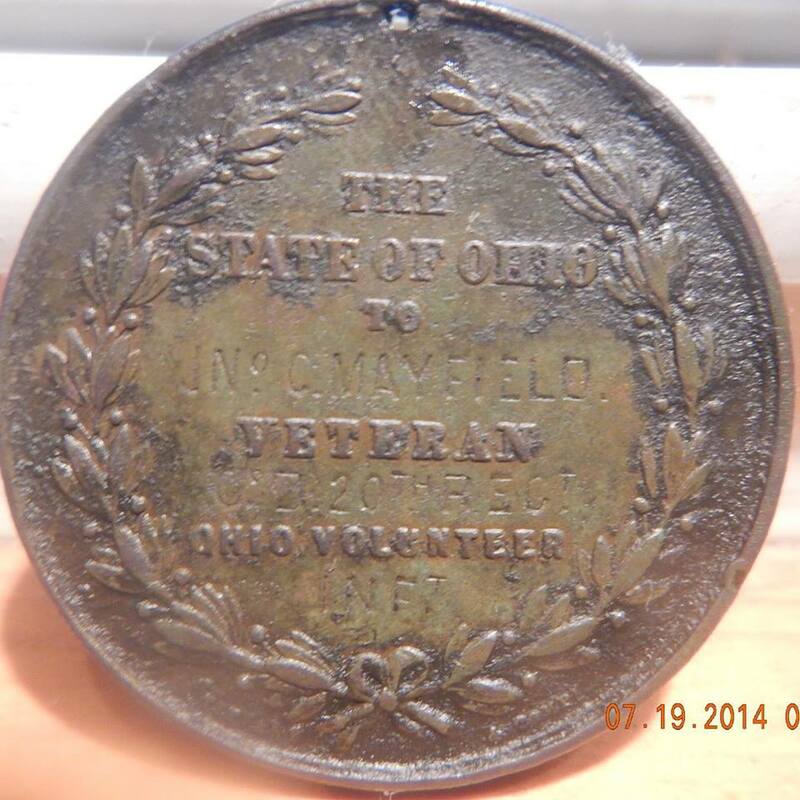 Tim had given the medal to the property owner but will never forget the forgotten history of just one of the hero’s that fought in the civil war. I started detecting back in the early 70s with an early Heath-kit model I borrowed from my scout leader. I grew up in 2 neighborhoods in Des Moines, Iowa. Until I was 10 years old, the neighborhood was full of 1920 homes and then we moved to a neighborhood that was a mix of 1920-1940 homes. My neighbors back then wouldn’t care if I looked in the parking lot or their yards as I was there afternoon paperboy. 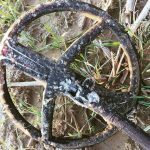 I got out of metal detecting for decades and got back into it 5 years ago. I still to go back to the old neighborhoods that I grew up at but most of the neighbors that I remember have passed on now, but still some of their children live in the homes. So first, The door knock comes with a friendly smile, and your first reply is that “I used to live in the neighborhood” or “How you doing I’m Len and I’m out saving history today” and please don’t be standing there with your “death to all” shovel in your hand! lived and reminisce on how it looked and how it has changed. Explain to them you were driving by and decided to stop and ask for permission to look thru their yard as you’re a seasonal metal detectorist and it’s a great hobby. 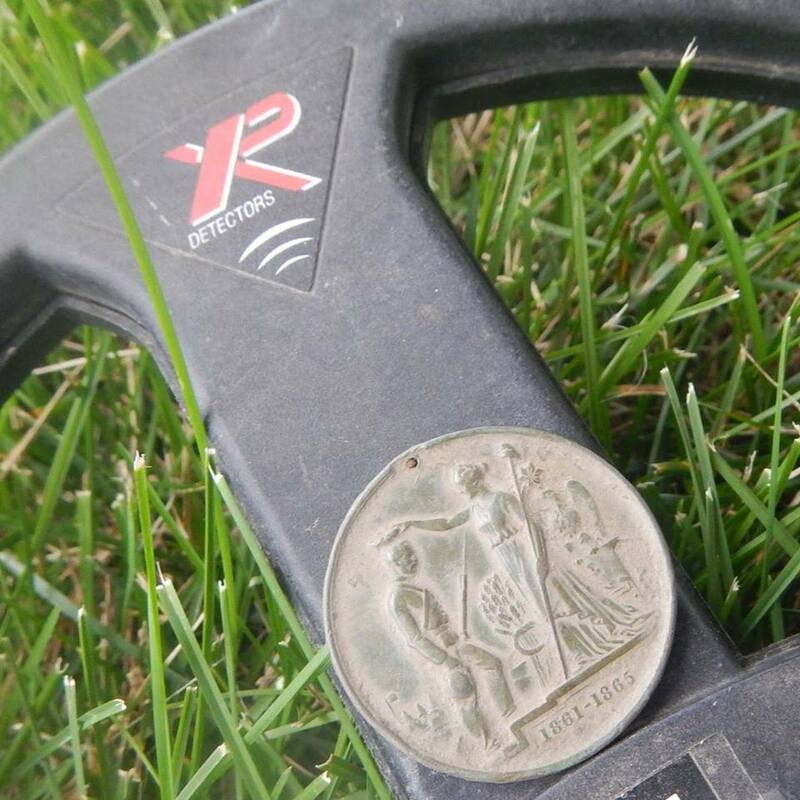 Tell them you want to save history that was lost or just dropped and you get your exercise metal detecting on your few days off of work each week. This usually gets you into the yard and I also throw in a spiff by saying that “I will give you all the money I find in your yard from the last 50 years!” Some people won’t even care to see what is found! Tell them you would like to return any inscribed rings or sentimental pet tags to them you gain there trust with you. Don’t forget to tell them this might take several visits to accomplish, explain to them about closer to the surface objects masking deeper items and you might have to return a few times in the future to recover the deeper silver coins and relics that still remain. Show them how you make a plug after you find a target and how the depth doesn’t affect the roots to the turf. Make sure there is a seal from returned plug to original position and it’s airtight to the rest of the existing turf so it’s less likely to die. Don’t leave excess dirt around your plug as this looks like someone sprayed a can a black spray paint around it especially after it rains. This should build your confidence up as you go from door to door because you can tell them “I was just two doors down at Helen’s home and I still have time can I look through your yard while I’m here” and offer the same deal as you offered Helen. Remember 2 story older homes had children and your percentage of good finds goes up with more people living there. Now you can strategically access on your cell phone the counties assessors’ page. Look the address up! 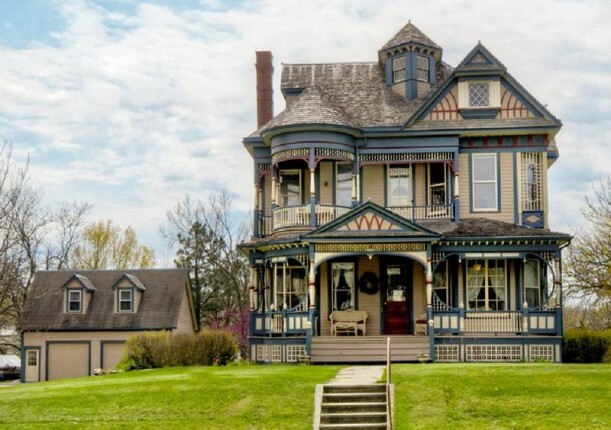 See the year of house you’re looking at! Know the owners name before you even knock! Use the same sales pitch as I do metal detecting as a hobby and for exercise on my days off and would like to look through their yards and I would gladly return all money found from the last 50 years I find. So there’s nothing for them to lose in the deal. Usually you can get some referrals from doing their yard, when you’re completed show them what you found and they become somewhat excited and I sometimes return dog tags to the owner which shows you have sentimental feelings. I return all inscribed jewelry also back to the homeowner. And I always leave one of my hobby cards with my contact information for them to refer me more of their friends in the future. Take a picture of the owner with something you found that they lost as a child like an old pocket knife or Tootsie metal car they once played with. 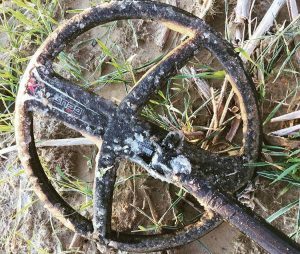 Door knocking for some detectorist can be a complete nightmare! But the worst they can say is no. Don’t feel bad there are tons of places to get on. 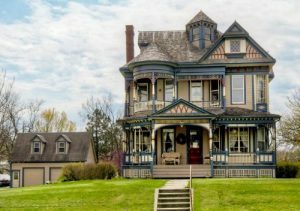 If you use your same sales pitch, state you like to save history, and are careful not to damage their yard, your percentage on being able to hunt the yard is quite high. Carry a yearly calendar book when you go up to the door, make notes of the homes address, owner’s name and phone number. So if you’re out driving down an old street and someone’s out mowing or raking or just taking the garbage can out, pull over curbside get out and start up a conversation and you’ll usually get the yard to find your treasure! Now that the holiday season is upon us, colder weather is starting to blow into much of the country. For many, this means going into detecting hibernation as we wait for spring temps to thaw the earth. For me, it simply means layering on as many clothes as I can move in, while hoping the ground isn’t too frozen to chisel through. I’ve had days where only the first inch of frozen crust reveals warm-butter-like dirt below it. I’ve also had days where, despite my best efforts, my spade won’t make a dent. A few years ago, my friend James and I spent a cold January day at a farm field in New Jersey, braving the low temps and occasional gusts of winds. 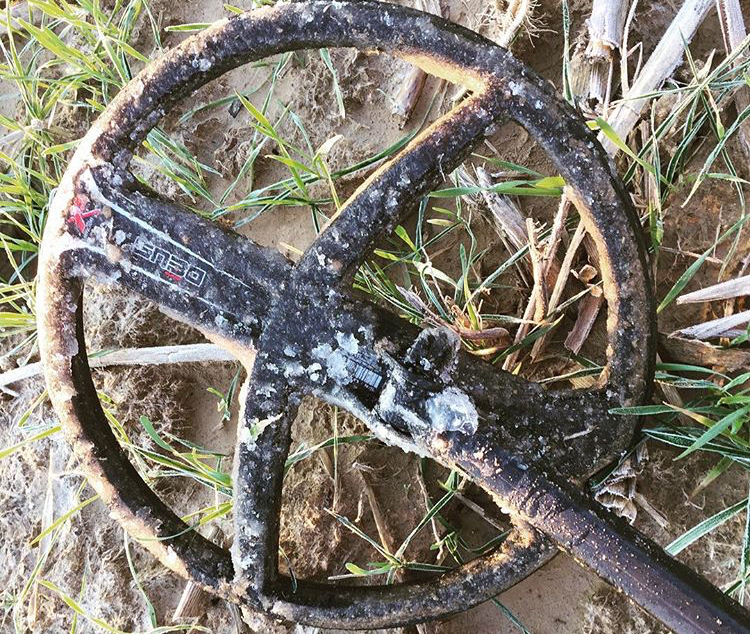 While the ground was only frost covered, it was still diggable – even muddy at times. It was so cold that my XP Deus coil was soon encrusted by a thin layer of ice – and it still worked great! 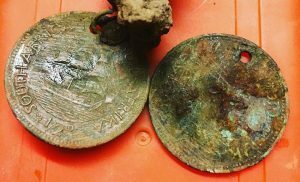 With frost on the ground and winds in our backs, we spent a full day detecting, looking for colonial and 19th-century coins and artefacts. Navigating through the corn stalk stubble, I started out slow and dug up a lot of modern trash. But things started to heat up when I unearthed a 1765 half real. It’s such a thrill to find old Spanish silver, and I was hoping that this was a sign of more things to come. I went on to find some 19th century flat buttons, a thimble, musket balls and shot, and then found a 2-piece button that I hadn’t seen before. 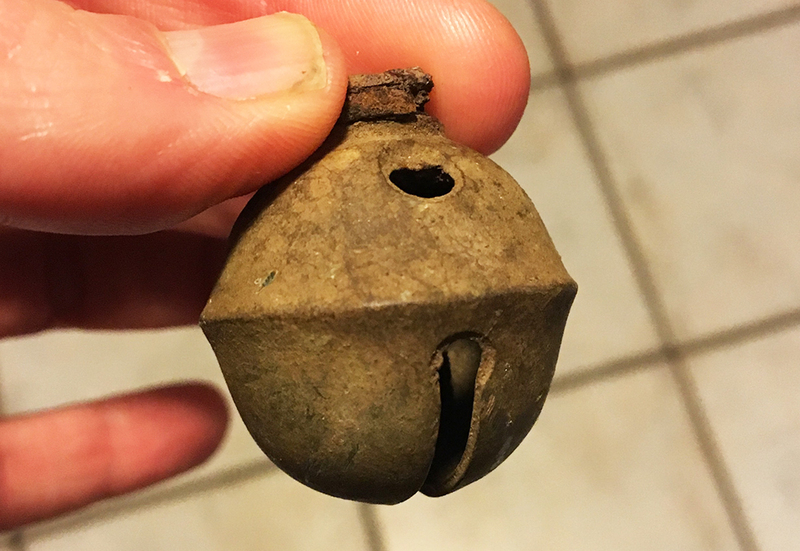 After cleaning it up and doing a quick Google search, I learned that I had found a mid-19th century musician’s lyre button. I love the design and it’s in very good shape. Oftentimes I find a whatzit. 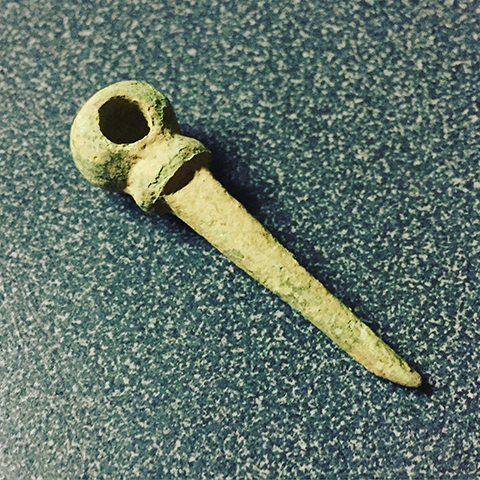 I’m not sure if this copper piece is a pin or served another function. Do you know? If so, please comment below or email me at xpteamusagrant@gmail.com. 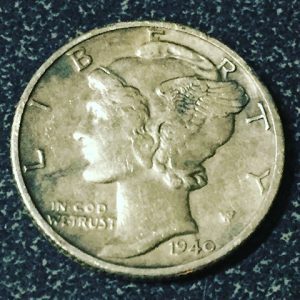 Before James and I sought refuge in the heat from my car, I managed to find another silver coin – a somewhat modern 1940 mercury dime. Cold days and rough weather can be daunting, especially if you get skunked. But when you find good stuff, no matter how cold it is, you itch to get back out there! Layer up! On my legs I wear thermals and fleece-lined pants; on my upper body I wear a long-sleeve thermal, t-shirt, long-sleeve shirt, sweat shirt, and winter coat. I can always take layers off if I’m too warm. Wear a winter hat! Keep your noggin warm and sharp. Wear mittens! Mittens are superior at keeping your hands and fingers warm. I wear surgical gloves under my mittens to keep my hands clean as I have to take the mittens off to retrieve targets. Get a good pair of winter boots! While they may not be cheap, there’s nothing worse than being out in the cold and feeling like your toes are going to fall off. Use heat-warmer insoles. These are thin foot warmers with adhesive that you stick to the bottoms of your socks. You barely notice them and they keep your feet toasty. Or should I say toe-sty. Wear a turtle neck or other scarf-like garment to keep your neck warm. I often pull it over my mouth for extra warmth. After spending the morning at a mid-19th century home site (read part one of this story here), my two friends and I journeyed to a nearby nearby permission where the home was built around 1790. Ordinarily, any home site from the 18th century gets us amped with excitement; this home was perched atop a hill with a beautiful view of the Hudson River. My imagination went wild thinking of Washington and his troops sailing up and down this river during the Revolutionary War, perhaps docking and scaling the hill to get to a nearby headquarters. We got our XP Deus coils to the ground as quickly as we could, just waiting for the good signals to pop through. I started on the side yard, and there were plenty of signals. My XP Deus got solid high tone after high tone, but unfortunately the targets were mostly memorial pennies with the occasional wheatie. 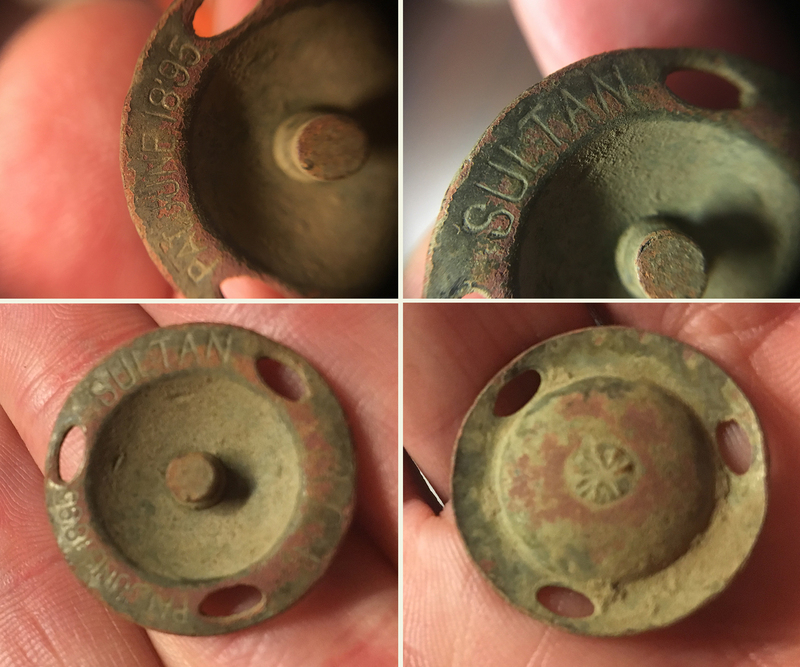 I then found something that I dismissed as a modern whatzit, but it was really a rare bottle seal closure/stopper that is marked “Sultan NO. 1 Pat. June 18 ’95. Never dismiss a find! 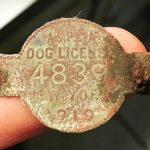 Shortly after the bottle stopper, I found a vintage dog license from the 1960s, but things got quiet. I moved on from the side yard to explore a small area behind the house. Almost immediately I found not one, but two large copper coins – hooked to each other! Upon inspection, I saw they were two Queen Elizabeth II African coins that someone fashioned into a bracelet or other type of jewelry. A very cool discovery! After the Queen Elizabeth II coins, I went a while without a decent find. 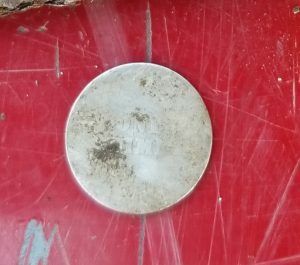 And although I found my second mercury dime of the day, it was not as old as I was looking for – but hey – I’m always happy to find silver. All I could seem to find was modern coinage. The sun was beating down on an already hot day, and I was getting discouraged. 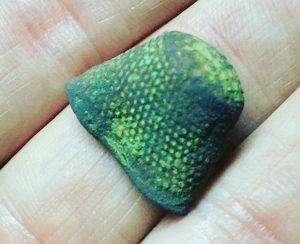 A small spark of hope ignited in me when my friend James found a beautiful, ornate silver thimble – but it was getting toward the end of the day, and I only managed to find a few more modern pennies. Prior to leaving, my friend secured me permission to come back since I don’t live too far away. I don’t like when a property defeats me, and I was determined to return to find more of what this property had hidden beneath the surface. And within a week, I was back – on another scorching day. I started my search in an area we didn’t focus on – the small front yard. I quickly resumed finding memorial pennies scattered about. Nothing old was coming up; not even old garbage. I then found something that I haven’t been able to identify… below is a photo and details. If you have any ideas, please leave a comment or email me at xpteamusagrant@gmail.com. More modern coinage and trash were interrupted by a little hope – I mason jar lid. Finally! Something somewhat old. Not as old as the house itself, but it was a good sign. 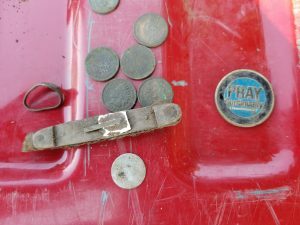 However, the mason jar lid was the only mid-19th-century find for the day as I continued to unearth modern pennies, foil, and scrap metal. With time running short. I decided to try a different area of the property. Slowly scanning my HF coil over the ground, I got a very nice high tone – low 90s. I looked down to see a beautiful vintage silver ring sitting right on top of the surface! I was surprised and delighted. 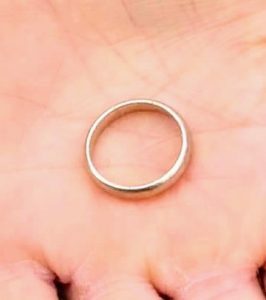 I asked the owner if anyone had lost the ring, but no one had to their knowledge. I ended the day on a high note (and tone), but still felt like I should be finding older artifacts. I decided to give it one more try a week later, this time using my HF round coil. I started my search at the top of the hill, overlooking the beautiful Hudson River. 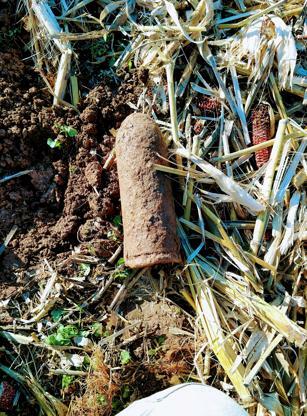 I was unearthing quite a bit of rubbish, and then a solid high tone revealed a crotal bell. Yes! Something old! Not crazy old, but old enough. I knew this property had more treasures hidden within it. And as a bonus, the bell still rings! I decided to focus on this area a bit, thinking more oldies would come up. They didn’t. 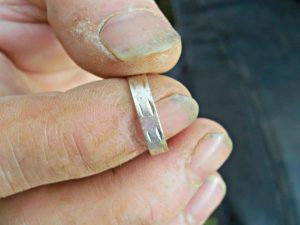 So I went back to the area where I found the vintage silver ring. I was rewarded with both a mercury dime and a war nickel. I then found something that looked like a tag. I couldn’t determine exactly what it was, so I pocketed it and would figure it out when I got home. Upon cleaning, an ASPCA New York dog license was revealed, with a date of 1919. 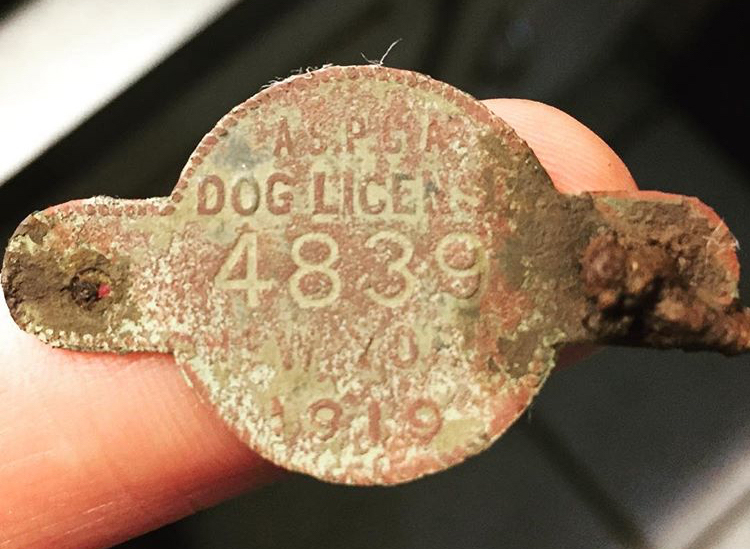 Almost 100 years old, and the oldest dog tag I’ve ever found! While not the 18th-century relic I was hoping to find, I can’t lie that I was quite pleased with it. Shortly after the dog license, I found what I thought was a Buffalo nickel, but I was wrong. It was a V nickel! With a date of 1909. I haven’t been back to the property since that last outing, but I think about it often. While I never submit to defeat, I’m just not sure I can scrape out anything more. My guess is the property has been filled over time, even though I didn’t see any real evidence of it. All in all, it definitely produced and the home owner and tenant have been super nice and accommodating, which is treasure in and of itself.